These NEW Nativity ribbons are stunning, the detail and colours are remarkable. 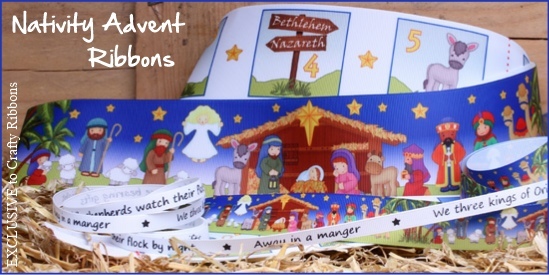 Three 62mm grosgrain ribbons create a unique Advent calender telling the Nativity story. From pocket number 1, where Mary sees an Angel to number 25 when Jesus is born and laying in a manger.